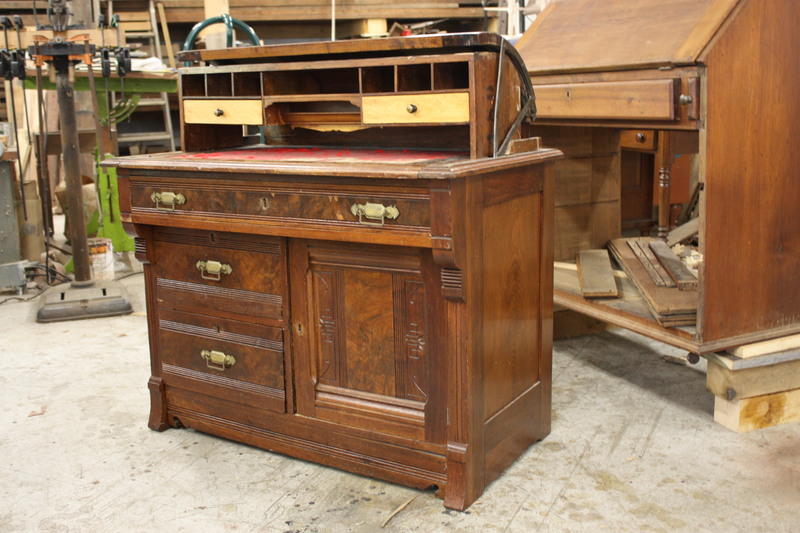 The restoration is now finished on this cylinder desk. 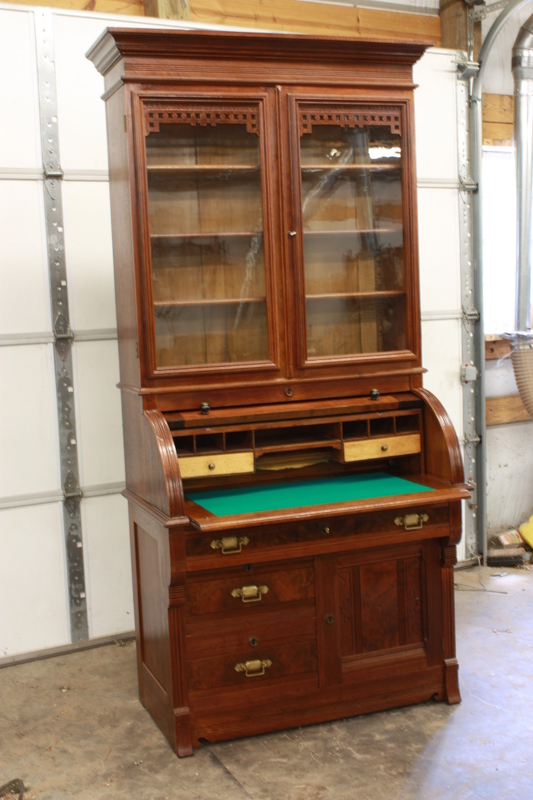 The desk is made out of Mahogany. In this photo the cylinder is retracted showing the pigeon hole compartment. The small drawers in the pigeon hole are veneered with Birds eye Maple. The writing surface slides out about 3″. The newly made molding is a perfect match. After grinding shaper knives from the pattern that I cast. The replacement molding was run. Both the left and right side of the return molding were missing. In the upper left of the top photo you can see oak molding, that doesn’t match, some one had put on. 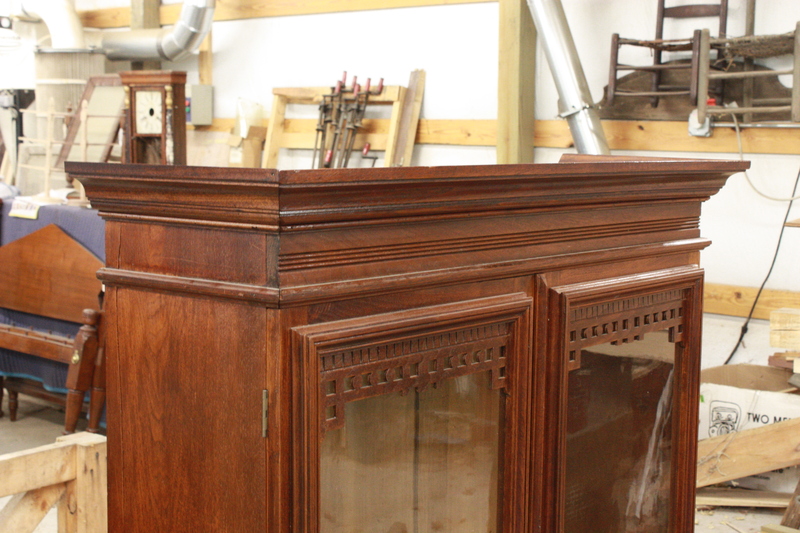 The mahogany molding was so close it just needed to be mitered and attached. 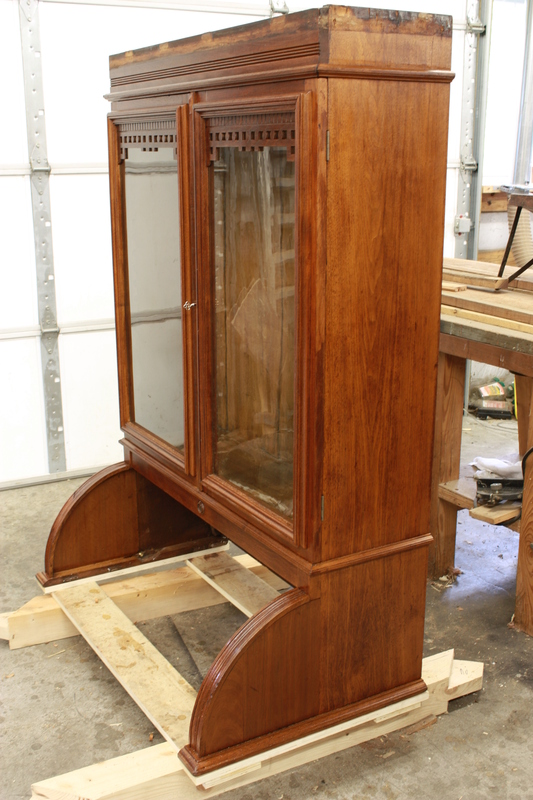 Next I stained and finished the molding. Here the silicone cast is remover and turned over. There is less than 1% shrinkage of the silicone. Measurements can be taken from the casting . Patterns can be drawn right from this to grind shaper knives. To make the casting of the molding. I first took the front piece of crown off. Then I made two dams across the molding out of clay. I used a two part silicone that sets in about 4 hours. When the silicone started to set a little I placed three 1/4″by 1/4″ wooden strips to stiffen the casting. I replaced the writing surface. What was on it when I got this piece was cheap red felt. 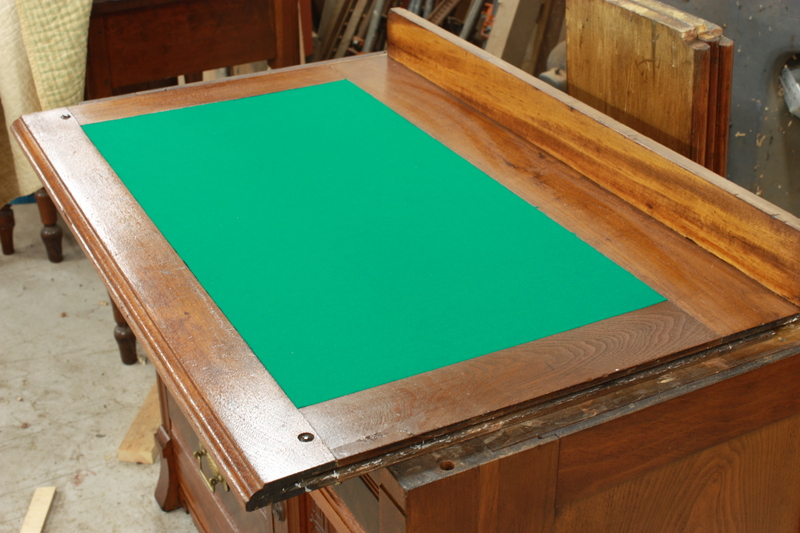 The replacement cloth is worsted wool billiard table cloth. This gives a very smooth surface that will not fuzz and is durable. 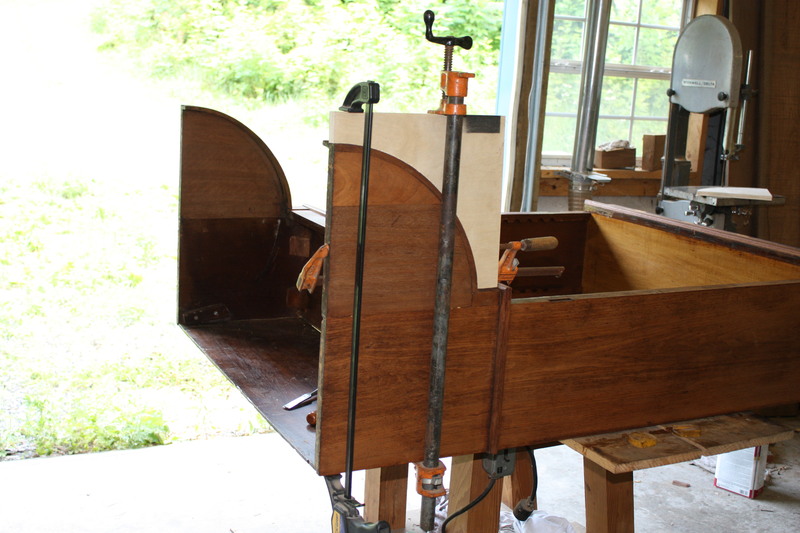 The quarter circles that enclose the lid and pigeonholes had to be re glued. This shows the way to clamp this piece. I used a piece of plywood cut out to distribute the pressure from the clamps . 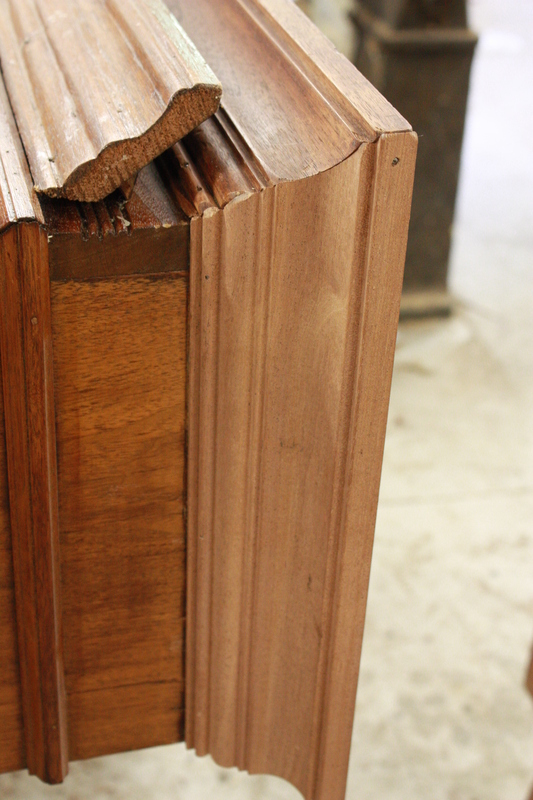 The molding on the left is a piece of pine half round some one had stuck on to the side of the bookcase. 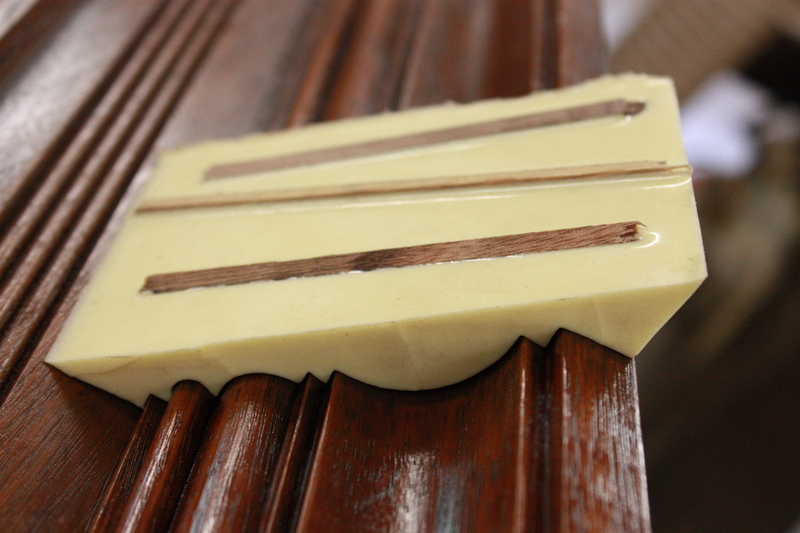 On the right is a piece of molding I made to match the original molding. The book case is complete except for the crown molding. 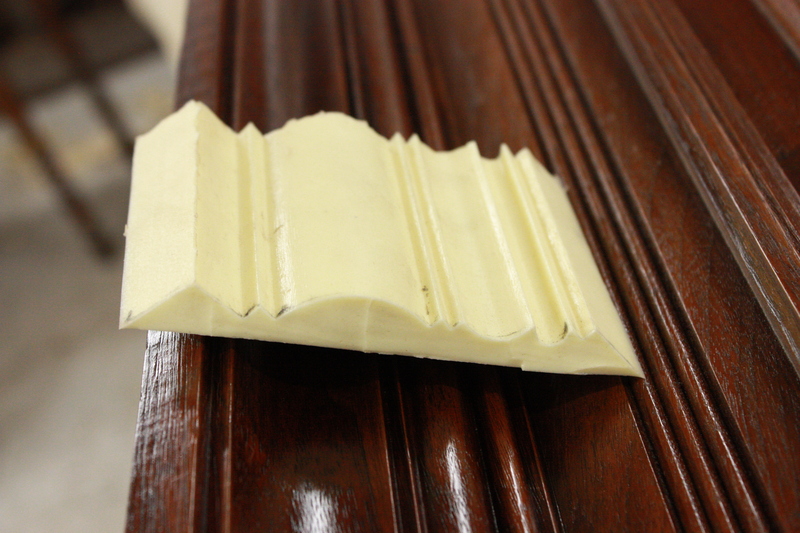 The crown molding is being made and will be another post. The plywood cleats on the bottom are for transporting. I feel very lucky to have the original glass. The glass is nice and wavy just the way old glass should be. This is the screw that the metal trammels pivot on. 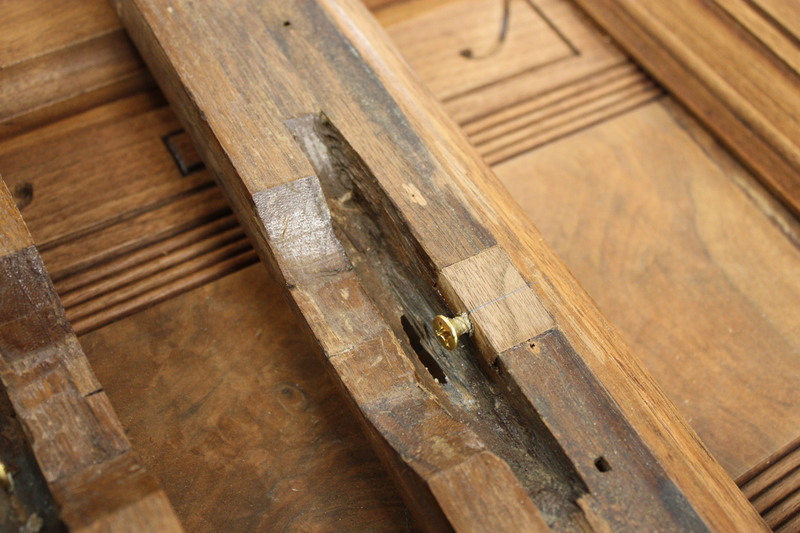 The original screw holes were worn out and had to be patched with new wood. 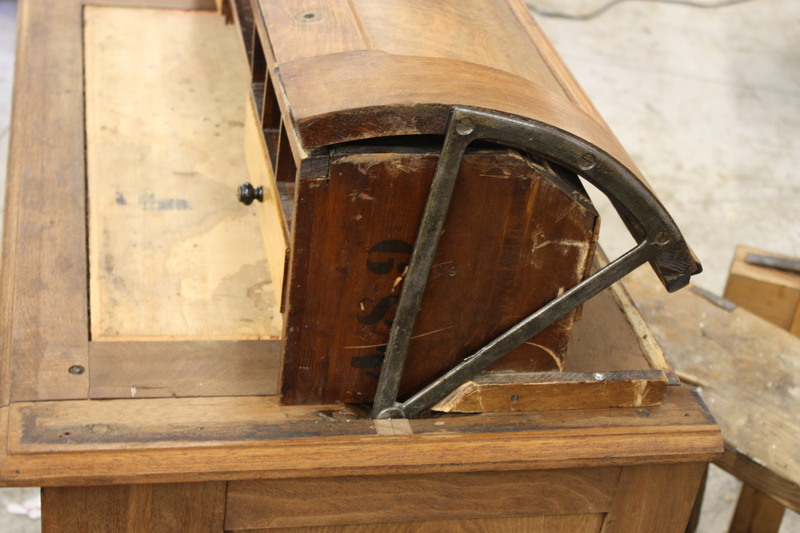 Here you can see the lid in the closed position.The metal trammel is fasten to the lid by screws and pivots on one screw at the bottom. When the lid is opened the pigeonholes are exposed and the lid retracts. 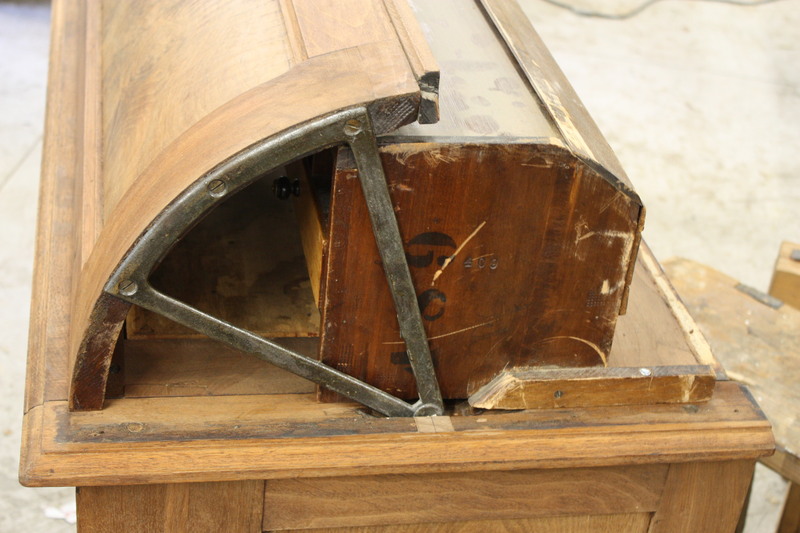 Notice the stop where the trammel meets a small angled block of wood on the side of the pigeonholes. 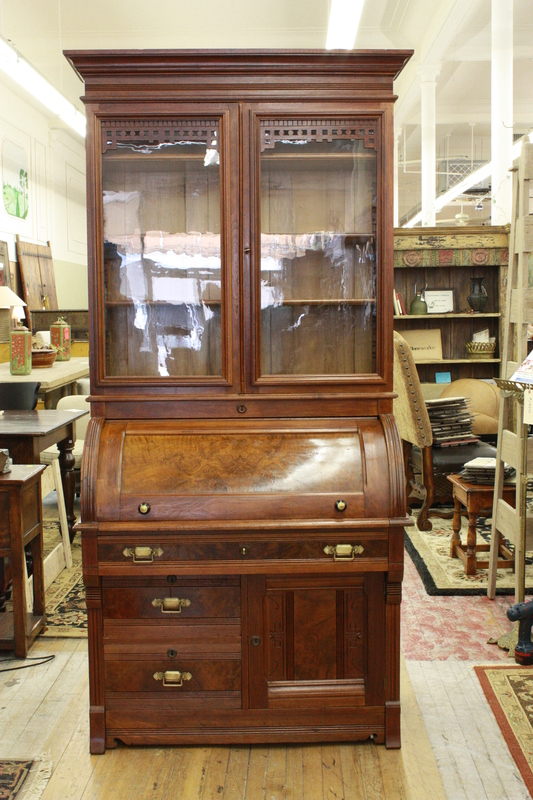 This is an Eastlake Cylinder Desk (1880’s) that I recently found. At first glance it didn’t look like to much was wrong with it. Once I had it in the shop I could see it need some attention. There was a poor lacquer finish on it. The writing surface was covered in cheep red felt and would not slid out. The pivots for the cylinder were worn out. 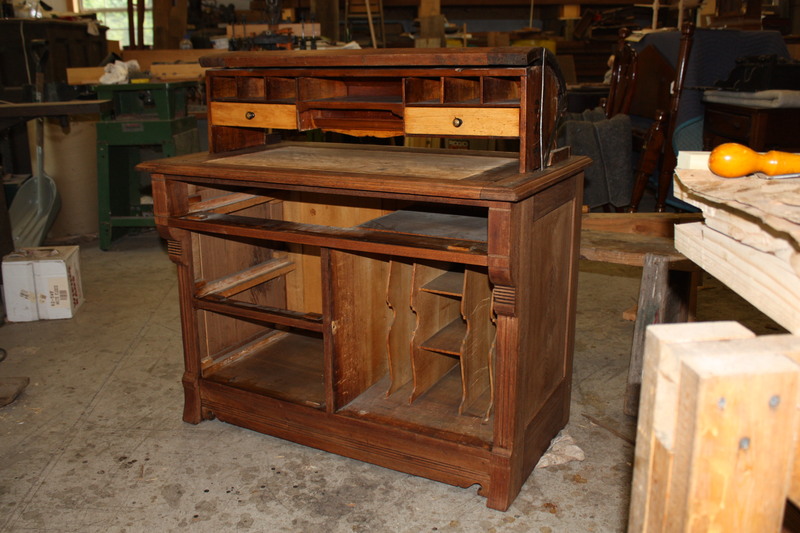 Not shown is the upper book case that covers the cylinder and pigeonhole interior. I’ll cover that in another post. 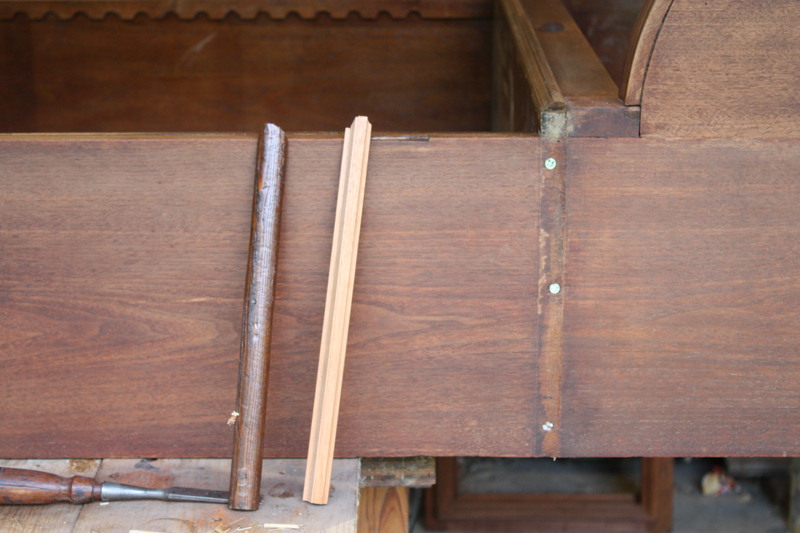 The lower photo is after being stripped.